Anyhow, in the last couple of weeks, Jesse and I have gone to DC's Screen on the Green a couple of times, traveled to Virginia Beach, and I turned 31 and went whitewater rafting for the first time ever. Turning 31 was made a bit better by the amazing friends and family I have. 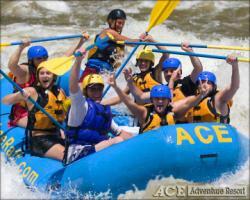 Whitewater Rafting, on the other hand, was one of the more difficult things I have ever done. I honestly wasn't sure I would make it to 32 while we were surfing, but I am here to tell you I made it with just a minor bumps and bruises. Don't look for me too hard in that photo. I'm not in it - rafting-specific photos to come, but I have pasted a few from the rest of the weekend below. Our rafting experience was intense, but we had a great guide, Randy the Wolfman, and ACE Adventures did a great job keeping everybody safe and our trip organized, but fun. Our cabin, Pies and Pints, the restaurant we went to on Friday evening, our cookout on Saturday night, which included some delicious s'mores, and a few rounds of the game Taboo, only added to our weekend experience (along with two trips to Walmart). Finally, what's a road trip without a few sites along the way? The following site was by far, the most spectacular thing I have witnessed in the state of Virginia thus far. Yep, that would be a t-rex eating a hotdog. Next time, I plan to stop in Natural Bridge to see Foamhenge and then I can really make a call on which roadside attraction is the best.